Keratoconus is a progressive eye disease in which the normally round cornea thins and begins to bulge into a cone-like shape. This cone shape deflects light as it enters the eye on its way to the light-sensitive retina, causing distorted vision. 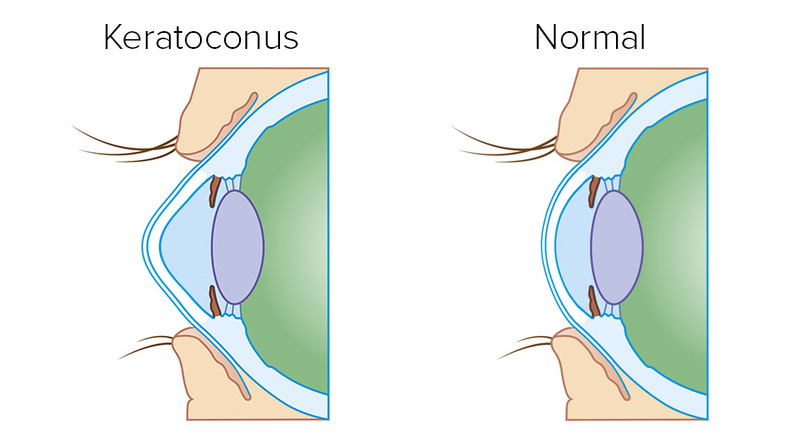 Keratoconus can occur in one or both eyes and usually occurs in people in their teens or early twenties. Keratoconic patients often have prescription changes every time they visit their eye care practitioner so it’s important to have annual eye exams. Research suggests the weakening of the corneal tissue that leads to keratoconus may be due to an imbalance of enzymes within the cornea. This imbalance makes the cornea more susceptible to oxidative damage from compounds called free radicals, causing it to weaken and bulge forward. Keratoconus is also associated with overexposure to ultraviolet rays from the sun, excessive eye rubbing, a history of poorly fit contact lenses and chronic eye irritation. For the mildest form of keratoconus, eyeglasses or soft contact lenses may help. But as the disease progresses and the cornea thins and becomes increasingly more irregular in shape, glasses or soft contacts may no longer provide adequate vision correction. Gas permeable contact lenses. If eyeglasses or soft contact lenses cannot control keratoconus, then gas permeable (GP) contact lenses are usually the preferred treatment. The rigid lens material enables GP lenses to vault over the cornea, replacing the cornea's irregular shape with a smooth, uniform refracting surface to improve vision. Piggybacking contact lenses. This method involves placing a soft contact lens on the eye and then fitting a GP lens over the soft lens. This approach increases wearer comfort because the soft lens acts like a cushioning pad under the rigid GP lens. Hybrid contact lenses. Hybrid contact lenses have a relatively new design that combines a highly oxygen-permeable rigid center with a soft peripheral skirt. Scleral and semi-scleral lenses. These gas permeable contacts have a large diameter that allows the edge of the lens to rest on the white part of the eye, known as the sclera. These lenses vault over the irregularly shaped cornea, allowing for a more comfortable fit. They also move less as you blink. Scleral lenses cover a larger portion of the sclera, whereas semi-scleral lenses cover a smaller area. Intacs. These tiny plastic inserts are surgically placed just under the eye's surface in the periphery of the cornea and help re-shape the cornea for clearer vision. Intacs may be needed when keratoconus patients no longer can obtain functional vision with contact lenses or eyeglasses. Corneal crosslinking. This procedure, often called CXL for short, strengthens corneal tissue to slow down or prevent bulging of the eye's surface, which in turn can reduce the need to undergo a corneal transplant. Corneal transplant. Some people with keratoconus can't tolerate a rigid contact lens, or they reach the point where contact lenses or other therapies no longer provide acceptable vision. The last remedy to be considered may be a cornea transplant, also called a penetrating keratoplasty (PK or PKP). Even after a successful cornea transplant, most keratoconic patients still need glasses or contact lenses for clear vision. With an annual comprehensive eye examination, it is possible to detect keratoconus in early stages before the disease progresses. For more information on keratoconus please visit AllAboutVision.com.